Let's hop to it, team! What's more adorable than a bunny? Go ahead, we'll wait. We'll be right here waiting for your answer... Well? You can't think of anything, can you! Neither could we! Seriously, we spent like two weeks trying to think of something more adorable than a bunny and all we got was a puppy crossed with a baby. Everyone loves bunnies! And how could we not, with those cute pink ears and that fuzzy little nose. And those buck toothed chompers are perfect for eating carrots which, as Bugs Bunny taught us, are a bunny's favorite food. A bunny hopping around and sniffing with that little nose while munching on some carrots is basically heaven, both for the bunny and for us! And now it's your turn. You get the chance to suit up as the world's most adorable creature, the bunny! You might know that the technical term for a bunny is rabbit, but when it comes to adorable, you have to call them bunnies. Or you can say "bunny wabbit" like a cute little kid, but "rabbit" isn't a cute word. It's just not. So put the white fur on and hop around, bunny wabbit. You're about to make a magical day for a bunch of kids. And if it needs to be a fancy event, this bunny costume already comes with a vest and tie, ensuring you'll never be underdressed! It's basically perfect for any event, whether at a wedding, or just lounging around at home. In fact, why aren't more people married by someone in a bunny costume? Can you imagine the delight of those wedding guests? 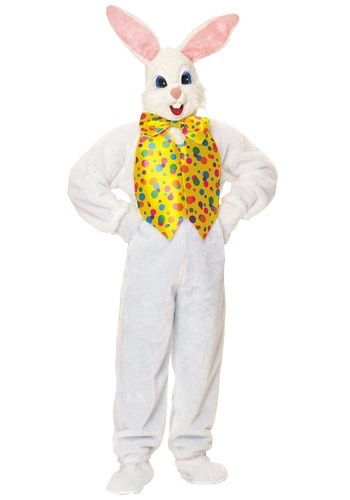 Now that we think of it, this is officially a wedding bunny costume!